If the plunger just not doing it for you, CRG Plumbing & Maintenance offers a superior high pressure water blasting service that can assist with blocked drains and high pressure water cleaning. Water jet blasting, or hydro-blasting, is the latest technique to unblock and clean pipe work. This technique is effective because we use high pressure water to flush debris out of the pipe line rather than push it further in, as many older techniques do. By conducting this service the debris is completely removed from your line, and your chances of blockage in the future are minimized. 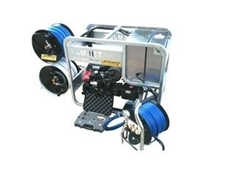 Using a combination of our water jet blaster, CCTV camera and locator enables us to carry our a more thorough service and is generally advised in cases where ongoing blockages are occurring. What is the difference between a water jet blaster and an electric eel? Although an electric eel will cut through the roots, the debris will remain in the line resulting in further blockages down stream. 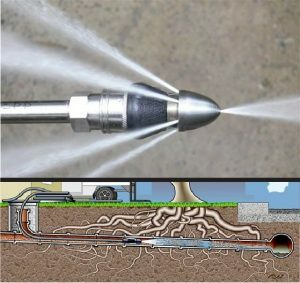 By using the jet blaster, the root is cleared and flushed through the pipe leaving a clear path to prevent further blockages. If you’re tired of getting blocked drains, call us and we can come out and inspect the line to find out what is happening and what is continually blocking it. Let our experienced team unblock your pipes now. Call Cameron on 0438 517 522 now.